Onto the #4. In true Soviet spirit, my woman is cleaning the kitchen while I'm sitting on the couch drinkin the tastiness. The color on this brew is absolutely fantastic. It has a rich cherry brown color, and actually has a hint of cherry flavor. There is also a bit a caramalization in the front, with a slight bitterness in the back. The smell is a sweet berry aroma that doesn't match the taste as well. 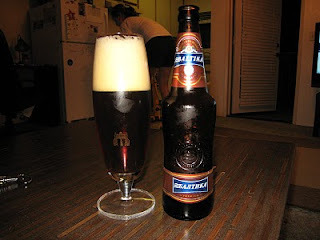 I am honestly very surprised with Baltika while drinking this one. This is the first time I've tried them, and I wouldn't mind working through all the numbers.